Landree loves movies. It's probably been a few months ago now that we decided to let her watch The Little Mermaid. We actually took two nights to watch it, but she. loved. it! She's also a big fan of Madagascar. We have it DVR'd and watch part of it almost daily. Friday night we decided to rent Madagascar 2. I didn't think it was as good as the first one, but maybe it's because I've seen the other one a million times. Landree seemed to really enjoy it. 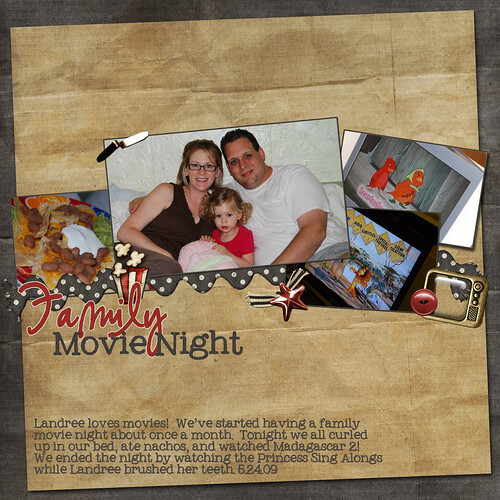 Here's a scrapbook page I made using movie trinkets by Shabby Miss Jenn. Here's the close up of us all curled up in our bed together getting ready to watch the movie. I hope this will be a tradition for us. We have so much just curling up in bed eating snack foods and watching movies :) This lady always has the coolest movie night ideas. How sweet! Hunter loves watching movies in the car on his portable DVD player. 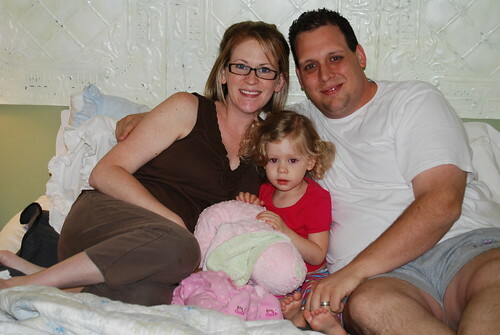 You have the cutest little family!!! looks like a blast, we love movie night over here too! Very sweet! Maddie LOVES Madigascar also, she loves the I like to move it move it! Actually Caitlin used to love it too except she couldn't say it right, her version was I like to moon it moon it! I was too funny! Hop over to my blog, I gave you an award! Thanks for the sweet comment and B multiplex recommendation. Can you only purchase that on-line? I just wanted to stop by and let you know that I have an award for you over at my blog. I really enjoy your blog and appreciate your follow, sweet comments, and friendship! Just wanted to pop over and say hello....I have been really bad at making the rounds lately. Hope you are all doing well.....How are you feeling? ?